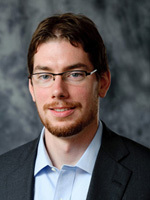 Jonathan D. Ellis earned his PhD in mechanical engineering from the Delft University of Technology (The Netherlands) in 2010. Prior to that, Jon studied at the University of North Carolina at Charlotte, where he received both his MSc and BS, also in mechanical engineering. Jon currently has a joint appointment as an assistant professor at the University of Rochester with the Department of Mechanical Engineering and The Institute of Optics. Professor Ellis' research theme is building novel instruments which enhance metrology capabilities and are used to improve manufacturing processes. He is also interested in system integration for metrology tools onto existing precision systems or designing scratch-built systems for custom applications. Current research projects are in designing and developing smart optical sensors for compact, remote displacement sensing and for multi-DOF interferometry. In addition to those, he is also interested in linear displacement interferometry, high power gas laser frequency stabilization, refractometry, flexure systems, stage metrology, precision machine design, and capacitance sensor design.